This is not the most recent article about Festival of Lights. Read the article about Festival of Lights 2013 instead. Living in a large city has several advantages. Besides the fact that you have many clubs, attractions and other great opportunities you also have free festival every now and then. After the Beerfestival and Carnaval of the Cultures earlier this year, now it is time for the Festival of Lights. 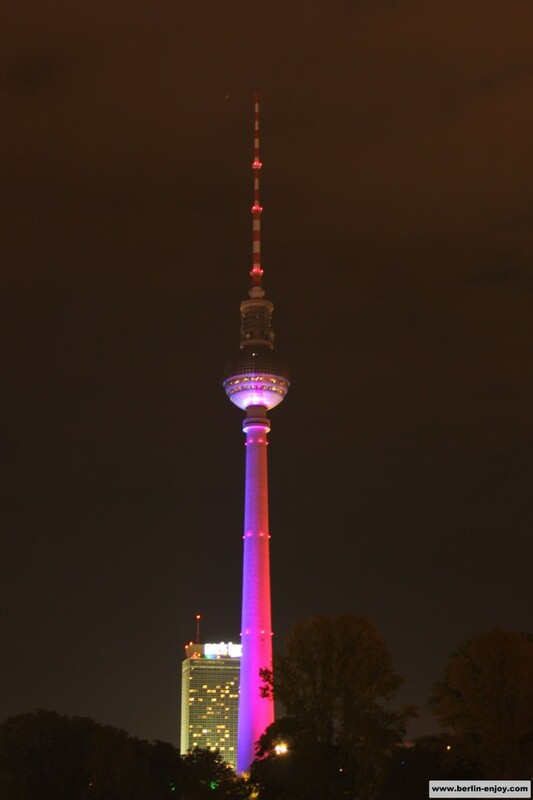 Every year in the middle of October the Festival of Lights is celebrated in Berlin. The festival is famous everywhere and attracts many visitors from all over the world. 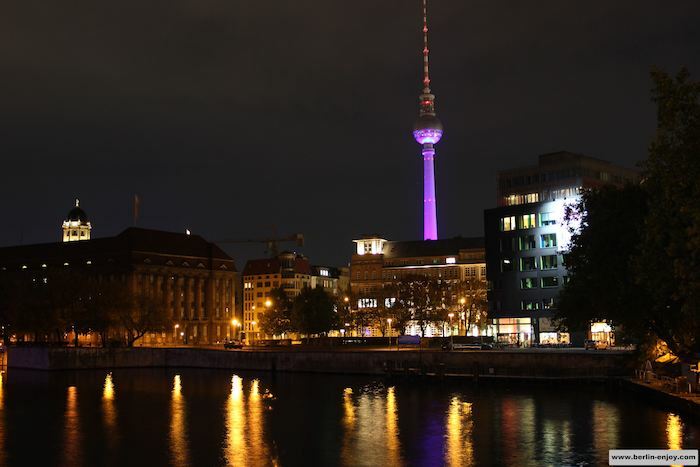 The Festival of Light makes sure that the great attractions which Berlin has to offer are in the spotlights for twelve days. From the 10th till the 21st of October the Brandenburger Tor, Reichstag, Potsdammer Platz and many other attractions are the best place to be for many tourists and photographersfrom. The initiative of the Festival of Lights came from a woman named Birgit Zander. In 2005, she came up with the great concept and was brave enough to put her thoughts into action. Birgit is a real `Berliner´ and she wanted her hometown to be transformed into a real show with the city as the main stage and the buildings as the famous characters. Her mission was defenitly succesfull because since 2005 she already organized seven editions and every year more visitors come to Berlin to experience the Festival of Lights. On the website of the Festival of Lights you can find a very usefull list of the buildings and objects which will be `lightened´ during the festival. The list contains not less than 68 names including large companies, trainstations, town halls and all the main touristic attractions. Because the list also contains all the addresses it is very easy to find lightshows in the area where you live or stay. If your not convinced by the beauty of the festival yet, I would advice you to just visit one or two objects around your corner. I am sure you want more! 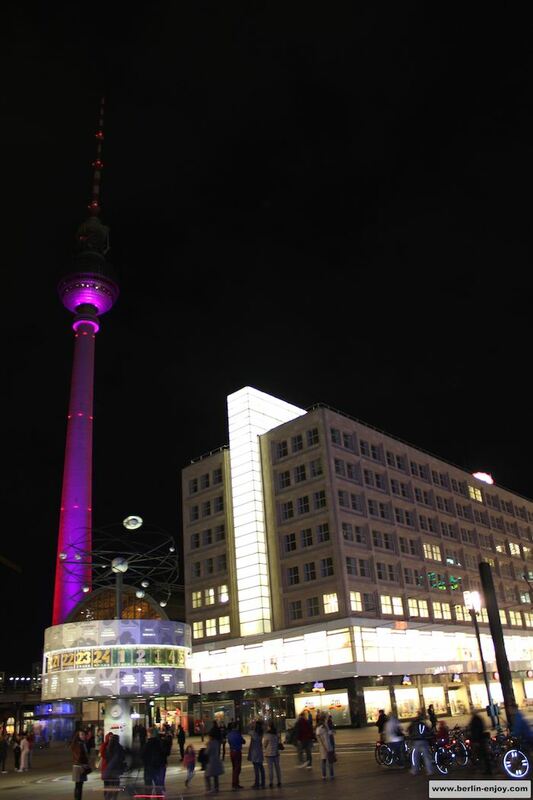 My Personal experience with the Festival of Lights is only based on Alexanderplatz and the Berliner Dom. The Fernsehturm at Alanderplatz is defenitly worth a visit but the lightshow at Berliner Dom is my favourite so far. 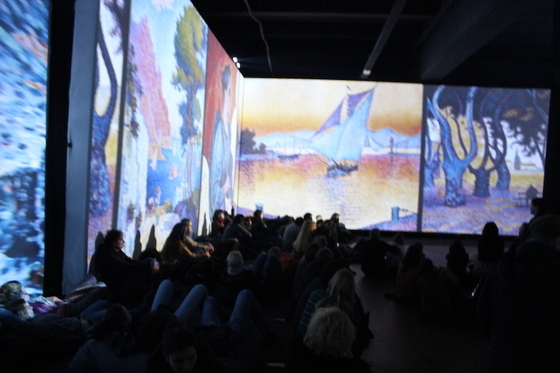 As can be seen on the photos, the lightshows are very spectaculair. 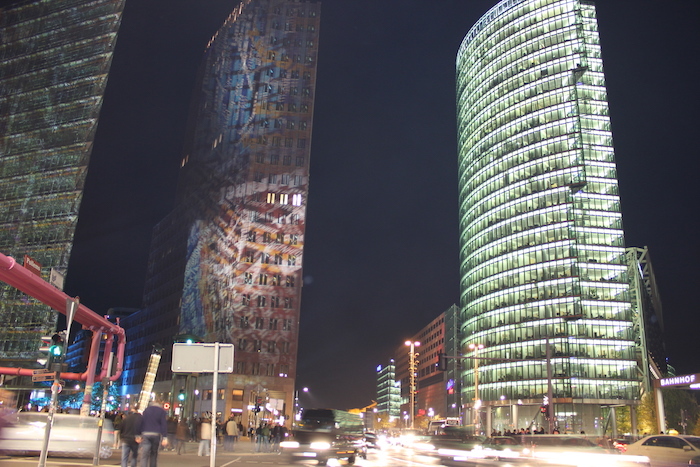 Every 30 seconds a new project was shown on the building and one was even more spectaculair than the other. It is defenitly great to spend your night in front of the Berliner Dom: take a drink, sit down on the grass and enjoy! Another advantage of the Berliner Dom was the fact that the Wachter der Zeit (Time Guardians) were present. During the Festival of lights the whole city is crowded but the location where the Wachter der Zeit can be found is even more populair for photographers. These four monk-characters (see photo) can be found all around town and look very mysterious. If you want to see them you have to check out the official Facebook-page of the Festival of Lights. The designer of the Wachter der Zeit, Manfred Kielnhofer, tells on his own website about the history of the Time Guardians. He tells that they were feared all over the world in the ancient times. The people were mainly scared because the four monks were the ones who judged the actions of people and decide if you belonged to the good or the bad side of life. During the Fefstival of lights the Warter der Zeit most defenitly add something to the story and the atmosphere. 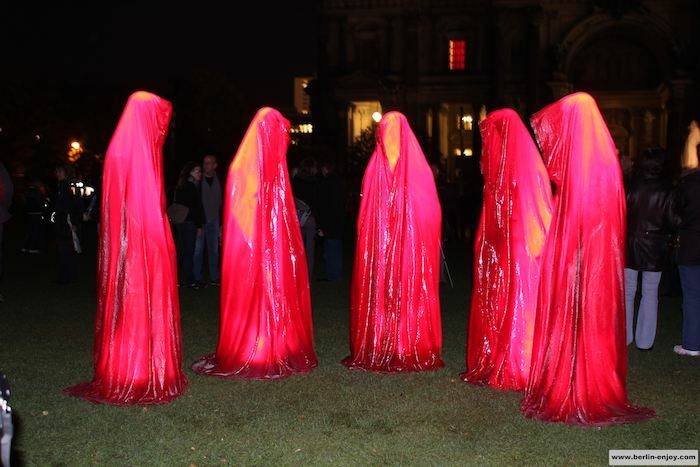 More information can be found on the website of Manfred Kielnhofer. 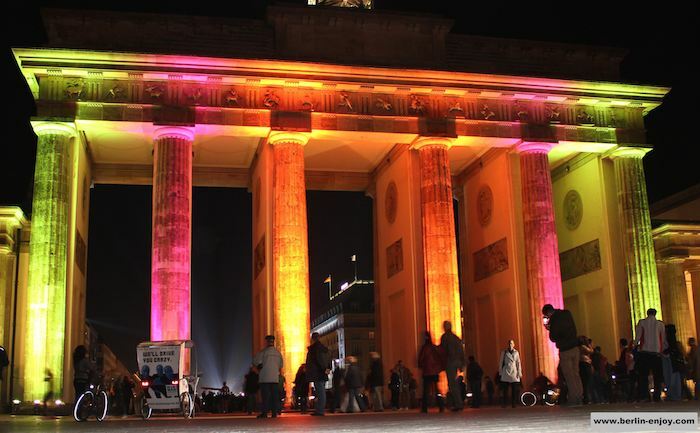 So far the Festival of lights has only been organized in Berlin. However, the team of Birgit Zander has enough ambition to expand to the rest of the world. On the official website you can read about their ideas and every city has the possibility to `buy´ the concept and lighten-up their own city. Therefore, the possibility exists that we will see a Festival of lights in Amsterdam, London or Madrid in the next couple of years. Sounds awesome to me! As mentioned before, you have the possibility to experience the Festival of light till the 21th of October. 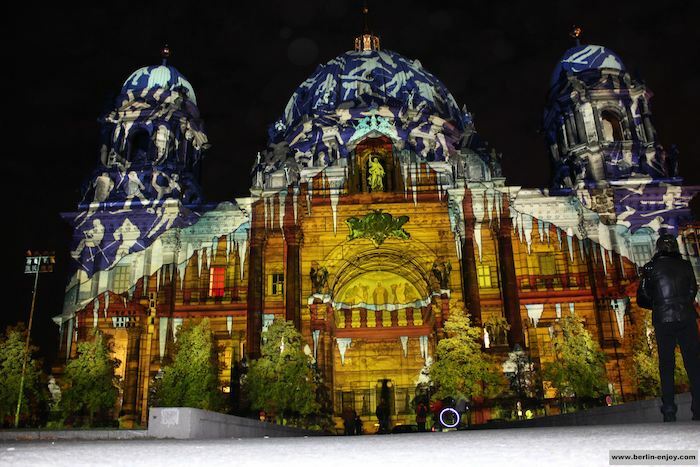 Every evening from 19.00 you can experience the lightshows all over the city. Everything is for free and it is defenitly worth your precious time. It is romantic, inspiring and lightens up your mood. Later that week I found the time to visit Brandenburger Tor and Potsdammer Platz. 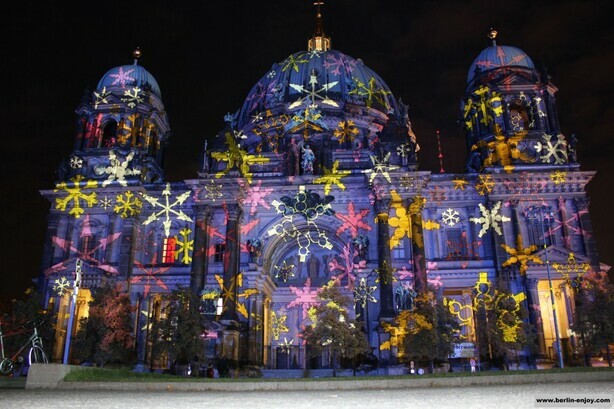 Both attractions were defenitly worth a visit but my Festival of Lights-favourite is still the Berliner Dom. The Brandenburger Tor was very colorful but in my opinion it did not change enough to be interesting for a longer time. Potsdammer Platz had this movement with different projects but still not as spectaculair as the Berliner Dom. Both attractions are defenitly worth a visit though! Judge yourself by the look of the photos!